Last time Euro politics affected the UK, we called a govt. of National Unity. May’s Tories put party before Patriotism & they must be punished. To some, there is something inherently anti democratic about a Government of National Unity. However, one of the most interesting strands in the weave of the rich tapestry of British history is just how well we can get along with one another – despite our at times bloodshed inducing differences. The most damning example of this form of unity government in British history, the Lloyd George led coalition that presided over the industrial slaughter of WW1 and the cancerous ‘peace settlement’ of Versailles which followed it, leaves a bad taste in the mouth about such coalitions to this day – a bear’s gob hangover from those mistakes and blunders that occurred as a result of the lack of Democratic opposition during that time. Another, greater, Government of National Unity is often forgotten about – probably because it was less official. Our memory of it has been replaced with the drone of piston engined planes, the kracking, grainy footage of bombing raids and beach attacks. The sound of the voice of the unlikely outsider. The Maverick. The man many thought incompetent, the man who was considered by some to be mad, others to be a traitor, and still more to be unfit to govern. I was not alive at the time to hear that old Wardog’s bark, the one we turned to after the man with the piece of paper failed. “We shall never surrender…” he said. It was a challenge to us all as a nation, and we proved it true. It was the hardest thing we’d ever had to do. But we proved it true. This election was not called by Theresa May out of calmness. Having been told we were to ‘carry on’, we found we had to stop, yet again, so that we could tick yet another box to give yet another failed, self serving politician the veneer of legitimacy and public approval most of them selfishly crave. This election was called by Theresa May because of Polls, political manoeuvring and unpatriotic personal gain. For proof, compare and contrast the choices made back then with the choices made now. Back then, Churchill invited his opposite number, Clem Attlee – a man he loathed, deeply – into government, to help with the national cause. Clem’s Labour Party was pretty much delegated the whole of the domestic front – rationing, healthcare, economics, you name it, all so that the War Dog could get on with prosecuting the war. 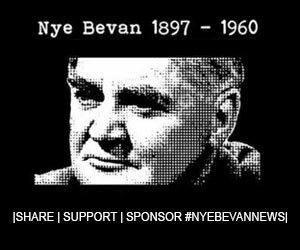 One of the main people who called for Churchill to be made Prime Minister, having also helped to remove Chamberlain, was, surprisingly, our namesake, Nye Bevan. Bevan was one of Churchill’s greatest critics, but Bevan, though he hated Churchill, understood that at times you must seek common cause, and was forthright in his opinion that, if it were to be a choice between Chamberlain & Churchill, then during a war the choice must be Churchill. It could ONLY be Churchill. It was somewhat unfair on Chamberlain, who did his best to stop Britain from fighitng in another war. It was not perfect, by any means. But it worked. That’s why we are still here. Given that for a long period we stood alone, it is also why we won that War. Why civilisation won that War. After the conflict, the bile and blood the politicians had directed at the Nazis came back into the domestic political arena, with Churchill’s infamous, bragging, boastful election campaign backfiring completely – does that remind you of anyone? Clement Attlee, he claimed, was a traitor. He was going to let the Stalinists in. The public, perplexed, responded with anger. They knew Clem was the man who had secured the Home Front, that he had, quietly, had just as much to do with the successful execution of the War as Churchill did. Indeed, if the War Office civil servants are to be believed, often times Churchill had to be kept busy and away from the important levers of power. In 1945 the electorate agreed that, now the War was over, the Wardog once unleashed, must be releashed. They kicked Churchill out of office for his Hubris. If Theresa May goes the same way, it will be for precisely the same reason: The people wanted a quiet, Calm Clem.